I am food blogger, webshop owner selling homebaked goodies, author of recipes books and a lover of creating recipes. Chocolate. Aw, we all love it. Or, at least, most of us do. And what better season for chocolate than Easter? Well, perhaps any season is perfect for chocolate. But, you have to admit, the idea of chocolate seems to be attracted to the season of chocolate eggs and all kinds of other chocolate treats. So, why not make some? Like, Cookie Dough Brownies or Scotch Crème Egg Brownies or No Bake Fudge or Crème Egg Gateau. Of course, you don’t have to just make chocolate treats for Easter. There’s always the fruity Simnel Cake, an English fruitcake tradition that is catching the attention of fruitcake lovers around the world. And there’s the Lemon Bakewell Slice. But you would have to appreciate the history and tradition of the Bakewell treats, as, in the United Kingdom, the real Bakewell is second to none. And, of course, Easter isn’t Easter without Hot Cross Buns, though this delectable treat is now available just about any time of the year in some countries. Victoria Dale’s delightful little book, Baking At Its Best: Easter Treats, is an interesting collection of recipes, complete with some background detail as well as some anecdotes about each recipe in the collection. The recipes are clearly presented, with clear instructions on how to prepare and serve the food creation. 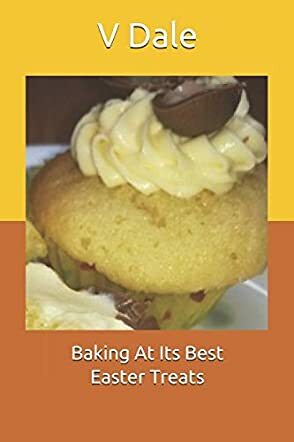 And, believe it or not, for a book of sweet treat recipes, the author also provides a nutritional guide for each recipe. Note: The measurements are in the United Kingdom’s system of grams instead of the North American system of cups and fluid ounces. So, depending on where you live, you may have to do some conversions.